Our range of products include aluminum rivets. 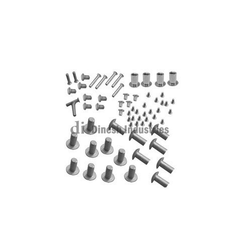 We are well renowned Aluminum Rivets Manufacturers and Exporters. EC Grade aluminum wire rod is used for the fabrication of Aluminum Rivets. The Aluminum Rivets supplied by us are known for giving high performance and are used in transformers, generators etc. These are available with us at market leading prices.